​Once you've tried braising tomatoes, there's no going back. This easy take on bruschetta is perfect as an appetizer, for brunch, or even as a snack! Shahir uses mid range extra virgin olive oil in this recipe to get the most bang for your buck — and not sacrifice flavour! Preheat oven to 400F. Combine all ingredients in an 8x8” baking dish and roast for 30-40 minutes, stirring every 15 minutes, until tomatoes are softened and concentrated. Remove from oven and cool to room temperature. Set roasted tomatoes aside, and save leftover oil for a delicious vinaigrette! Using a cookie cutter or the ring lid of a mason jar, cut a 3-4” round from each slice of bread, saving the crusts for breadcrumbs. Heat the olive oil in a large saute pan over medium-high heat for 3 minutes. Add bread rounds and cook for 3-4 minutes each side until golden brown and crispy. Season with salt, remove from pan and set aside on paper towel lined plate. Place each crostini on an appetizer plate. 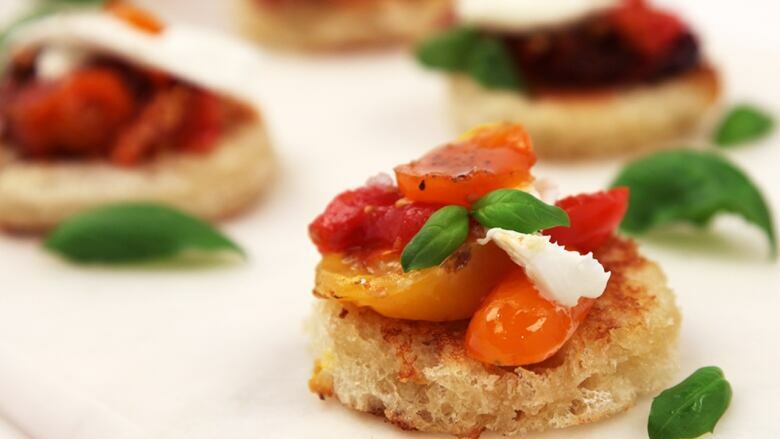 Divide roasted tomatoes evenly over crostini, garnish with basil leaves and cheese. Season to taste with salt and pepper, and drizzle olive oil generously over cheese. Serve and enjoy! Roasted tomatoes are best eaten at room temperature.